Nordic Inspired. A gorgeous christmas handmade card. Every image is stamped, coloured and then die cut to bring this card to life. 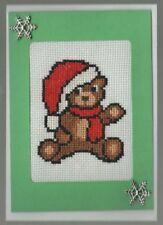 Crosstitched Santa Bear. Crosstitched card 11 x 15 cm. Handmade Card. Green Card blank inside. A gorgeous christmas handmade card. Using good quality Stampin Up products. A gorgeous christmas handmade card. Using good quality Stampin Up products. A cute christmas handmade card. Card has been embossed, image has been hand-stamped. Handmade card. Handmade Cards. This 3D box card (card in a box) is a great gift to the new two. Using good quality Stampin Up products. Images has been hand-stamped. Using good quality Stampin Up products. gorgeous christmas handmade card. Based has been embossed, the images has been hand-stamped and cut. With added bling. Using good quality Stampin Up products. Christmas handmade card. Using good quality Stampin Up products. gorgeous christmas handmade card. Made using Stampin up stamp image, paper, ink, glitter, glue, string. Only 10 available. 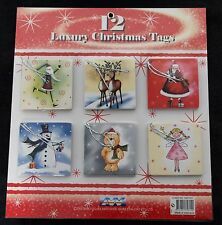 12 X PCS ASSORTED MINI HANDMADE CHRISTMAS CARD. Perfect for this Christmas season! Crosstitched Dog In a Christmas Hat. Crosstitched card 11 x 15 cm. Handmade Card. Red Card blank inside. with White envelope. With coordinated self-sealing envelopes. 24 Handmade Christmas Card Collection. Double your traffic. 6 each of 4 different card designs. Item include: 1 X 3D pop up card, 1 X envelop. Surprise your love ones with the pop up art. If your not 100% satisfied. We'll do our best to help you out and respond quickly. Material: Paper. I try to put a production/print year to substantiate this whenever possible. have been created with inspiration from a previous decade. I usually response within 12-24 hours. 'request a total'. Sewing is my happy place - I want it to be yours too! 3 X Handmade Christmas Cards Greetings Cards Xmas Cards. 5 X Christmas Cards Xmas Cards Greetings Cards. This is a set ofsix different, individually handmade, embossed Christmas cards. Since each of these cards are handmade there may be slight variations in each set. The white insert is hand stamped with either (3 of each). A gorgeous Christmas handmade card for a horse lover. A cute christmas handmade card. Card has been embossed, cut with added rhinestones and washi tape. 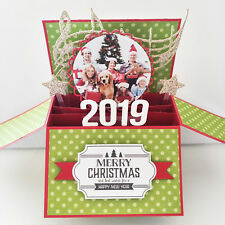 Beautiful Christmas handmade Card based has been embossed, image has been hand-stamped with added rhinestone and ribbon. Inside Card is Blank, for your own personal message Comes with matching envelope and plastic cover Card Made by Me, from Smoke and Pet Free Home. Quartz Collective's greeting cards are uniquely designed and made with equal amounts of love and sass. All of our cards are blank on the inside and printed on 300gsm recycled cardboard. Each card is 140mm X 140mm, complete with a white envelope. Using Stampin Up Products. 4 x Beautiful Christmas handmade cards. You will get 4 cards including envelope. Image has been hand-stamped. Cute Skate Christmas handmade card - Only One Condition is New. Sent with Standard delivery. 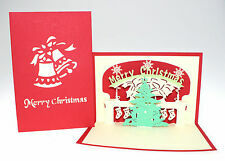 3D Up Holiday Greeting Card Christmas Tree Easter Day Thank You Card New. 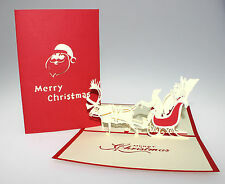 3D Up Holiday Greeting Card Christmas Tree Easter Day 15cm Thank You Nice.